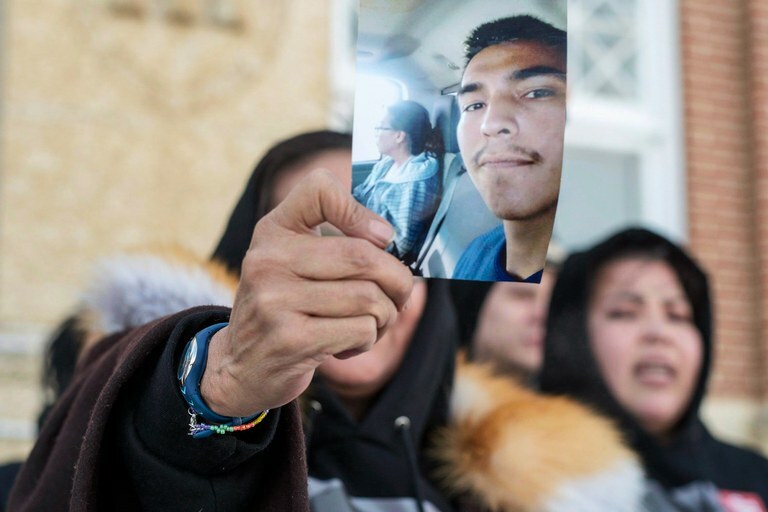 The night Colten Boushie was shot and killed in rural Saskatchewan, police surrounded the trailer of the deceased 22-year-old’s mother. More than a dozen officers, some with guns drawn, told her simply her son is “deceased,” before ordering the sobbing woman to her feet and searching her home without a warrant. As Debbie Baptiste sat crying in her living room, grieving for her son, one officer asked her whether she was drunk and smelled her breath. No matter the circumstances of Boushie’s death or the acquittal of his killer, a 52-year-old farmer named Gerald Stanley, last week, the handling of the investigation and the treatment of Boushie’s family are clear examples of the continued mistreatment of Indigenous peoples in modern criminal justice systems. The 18-month trial and Friday’s not-guilty verdict have divided the central Canadian province and opened old wounds among the country’s Indigenous communities. The facts of the case tell part of the story. Boushie, a Cree man, had been swimming and drinking with three friends in the Saskatchewan River in August 2016, and on their way home, their SUV got a flat tire. According to their own testimony, two of Boushie’s friends tried to steal an ATV from the ranch of Gerald Stanley, who was home at the time and fired a handgun into the air with two warning shots. The group returned to their SUV, followed by Stanley, and tried to drive away, but they crashed into one of Stanley’s vehicles instead. Witnesses testified that by then Boushie was unconscious in the driver’s seat, when Stanley approached and reached in the cab to take the keys from the ignition. Stanley testified that his handgun then discharged accidentally, shooting Boushie in the back of the head and killing him. There are, of course, many more details, and I would encourage you to read more about the trial. Debbie Baptiste, the mother of Colten Boushie, holds up a picture of her son as she leaves court on the fifth day of the trial of Gerald Stanley, the white farmer accused of killing her son, a 22-year-old member of the Cree Red Pheasant First Nation, in Battleford, Saskatchewan. Part of the story, perhaps, but not all of it. Stanley was acquitted by an all-white jury, and Native writers have been quick to point out that Boushie’s death and Stanley’s trial are part of an institutionalized pattern degrading Indigenous lives in Canada. Coupled with the facts that a multitude of cases involving missing and murdered Indigenous women lack proper attention or outrage, or that Native peoples have a higher risk of death when dealing with police, it’s no surprise that a distrust of the criminal justice system continues to linger in Indigenous communities. Canada is coming to terms with its horrendous treatment of Indigenous peoples in an increasingly public way. Prime Minister Justin Trudeau has promised to enshrine Indigenous rights into Canada’s Constitution, but Native leaders there remain cautious. As Manitoba Keewatinowi Okimakanak Grand Chief Sheila North told the CBC, she’s heard “a lot of good words” from Trudeau, but she’s waiting to “see how far” he takes them.